Being a big fan of the great outdoors, camping has become a regular activity for me. Over the years, I've learned about what I need and what I don't need to bring. A pillow is one thing that I always take with me. However, it wasn't always like that because I went through many kinds of camping and traveling pillows until I found the right one for me. Read on for a guide to finding the best camping pillow. As the name suggests, compressible camping pillows are those that you can compress. They are filled with feather/down, synthetic materials, foam, memory foam, or a mix of these. Each material has its benefits and disadvantages, but in general, compressible are the most comfortable. The downside is they don’t pack as light and small as the other types of camping pillows. An inflatable pillow uses air as its fill and requires inflation and deflation. You can adjust the firmness of an inflatable pillow by how much air you put in. To their advantage, they pack very small and light. If you want an inflatable, look into how easy it is to inflate, the valves, the material. They tend to move around more than regular pillows, so check if it has a non-slip material as well. A hybrid pillow takes features from both compressible and inflatable pillows. It takes comfort from a compressible and compact from inflatables. The synthetic, foam, or down fill is usually at the top portion of the pillow while the inflatable part is on the bottom. 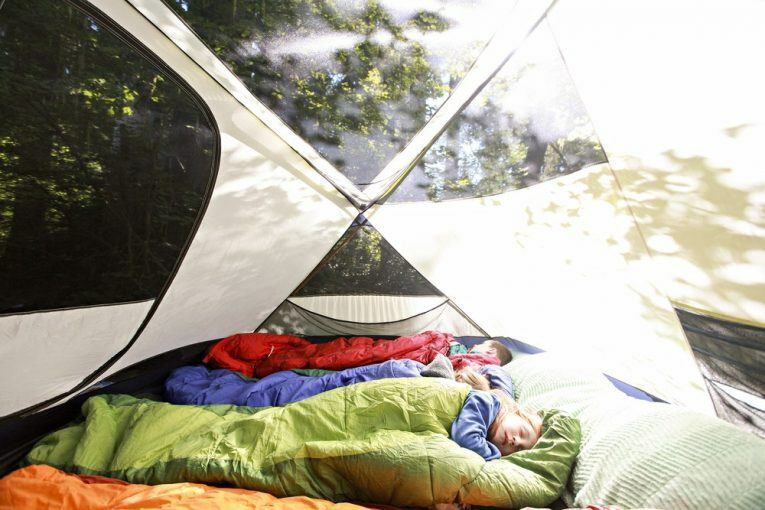 Aside from the type of camping pillow, there are a few other things you should consider. Think about your priorities. 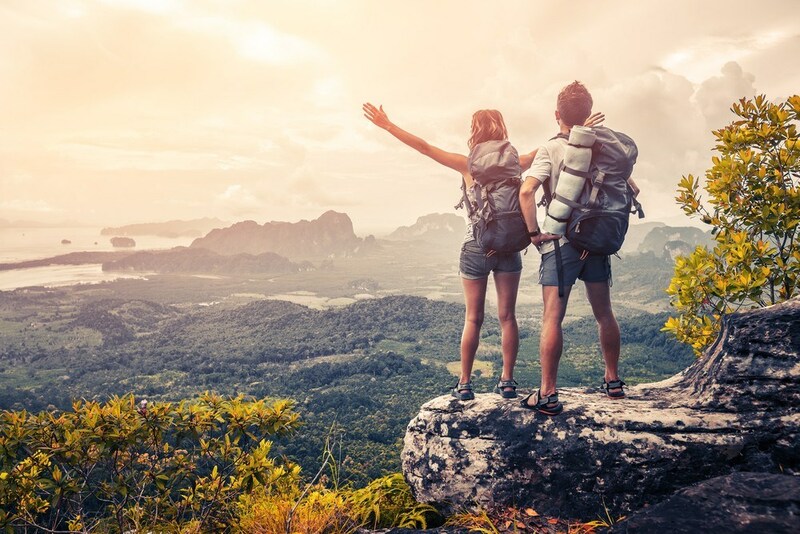 For backpackers, the lighter and smaller the option, the better. What’s important depends greatly on the camper, so think about what you want. The best pillow is not the same for everyone, and only you can decide what it is. 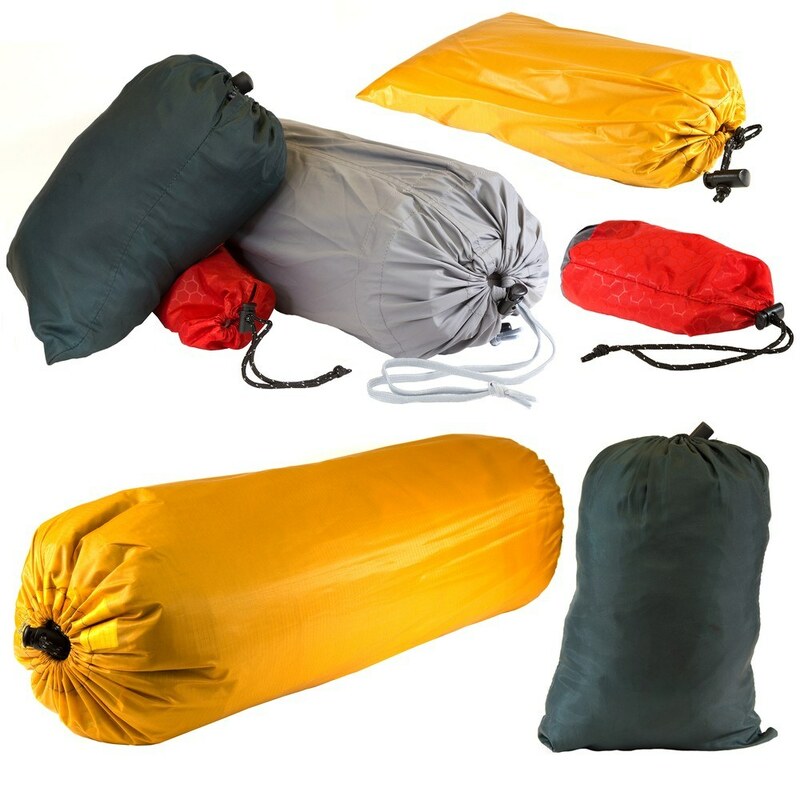 Think about these things as you compare the different options of camping pillows. A pillow’s softness/firmness and ability to support determines the comfort factor of a pillow. Make sure the pillow supports a natural head-neck-spine alignment, so you don’t wake up with aches. Compressible Pillows are softer, and they are also supportive, while inflatables are stiffer. However, you can adjust the firmness level by the amount of air you put in. If you are a car camping or RV camping, then the size might not matter so much. However, for backpacker, bikers, and other users that need to save on space, size matters. You need to consider two things when it comes to size: the expanded size and the packed size of the pillow. A smaller pack size is ideal for space savers, but make sure it has a good ratio to the expanded size as well. A small and uncomfortable pillow defeats the purpose of bringing a pillow. Like the size, the pillow’s weight is another factor to consider, especially for hikers and backpackers. Inflatables are lighter than compressible. The pillow’s fabric is another factor that contributes to how comfortable a pillow can be. Some pillows don't have such a nice feel on the skin and even become noisy when you move your head. Compressible Pillows are the easiest to use because you only need to either take them out of their bags or their sleeves. Hybrids and inflatables require a little bit of setting up. In this case, look into how easy it is to inflate or deflate. Check the valves to see if they make these tasks easier. Another thing you want to consider is how easy it is to clean. Compressible can either be hand washed or machine-wash. As for inflatables and hybrids, you can usually just clean it by wiping. The Nemo Fillo from Neme Equipment is designed to be a backpacking and camping pillow. It uses one-inch memory foam filling and has an inflatable filler that goes up to 3 inches. This hybrid pillow has a great balance of comfort and support, great for back and side sleepers. It also has a polyester microsuede for the cover for additional comfort. When fully expanded, it has a size of 10.5 inches by 17 inches, with up to 4 inches thickness. 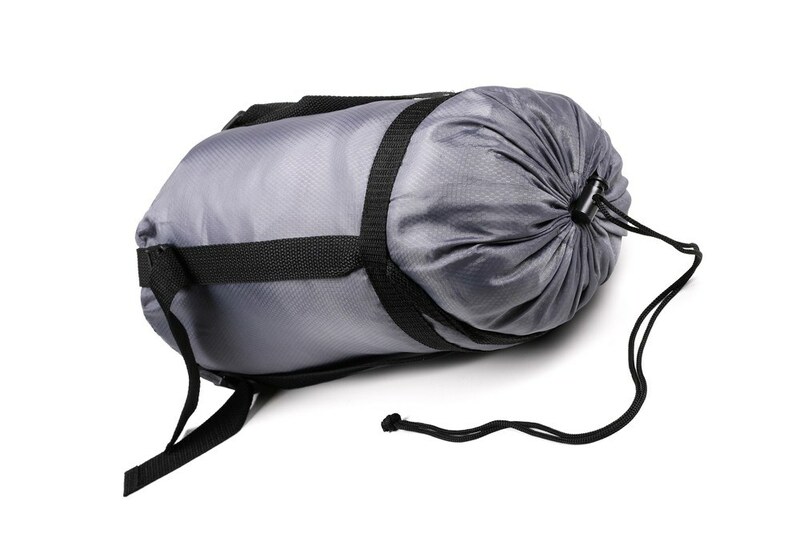 It packs into only six by 4 inches - great backpacking and camping size! The polyester microsuede is washable so you can regularly clean it. Another great thing about this pillow is that it doesn’t get warm, despite the memory foam material. It’s a great combination of comfort and support, perfect for either back sleepers or side sleepers. High cost compared to other options. It’s still on the heavy side when it comes to backpacking. If you are not worried about storage space or weight, the Premium Shredded Memory Foam Camping Pillow by Coop Home Goods is a great upgrade. Among all the camping pillows on the market, this one is probably the most comfortable one. It compresses to a smaller size, so it's easier to take around, especially if you're savin space. The pillow is made of memory foam that is CertiPUR-US certified. Memory foam tends to retain heat which can become uncomfortable. However, this pillow has a bamboo-derived viscose rayon and poly blend case that promotes thermoregulation to ensure you sleep comfortably. The compressed size is 10 inches by 6 inches, while the uncompressed size is 19 inches by 14 inches. The pillow and the stuff save altogether weighs around 36 ounces or 2.25 pounds. The memory foam follows the contour of your head, making it very comfortable and supportive. For a memory foam pillow, it stays kind of cool thanks to the thermoregulating cover. Memory foam takes long to dry up. It’s machine-washable and can be on tumble dry. Just make sure it is completely dry because memory foam and moisture can harbor microorganisms and mildew. It’s a heavy option and not ideal for backcountry hiking or camping and backpacking. The Therm-a-Rest Compressible is one of the most popular portable pillows on the market. It's used by all kinds of travelers, including campers and backpackers. The pillow has very soft urethane foam filling and brushed polyester cover. It's soft and supportive, without breaking the bank. You can even choose from four different sizes and many designs, giving you more room for personalization. The smallest size is 12 inches by 16 inches, the medium is 14 by 18 inches, large is 16 by 23 inches, and extra large is 16.5 by 27 inches. I got the medium, which has dimensions close to the Coop Home Goods pillow. On full fluff, it's about 4 inches thick. Compressed and tucked into the cover, it's about 12 by five by 5 inches or about 2.6 liters. Guaranteed to give you comfort and support, thus a restful night in your camp. You can choose from 4 sizes and many more colors and designs. It’s machine-washable, but make sure to follow manufacturer’s instructions. It doesn't require any setting up. You only have to unroll it out of the sleeve, and it's ready to go. Off-gassing in the beginning, but it goes away. It holds odor, so wash it when needed. Cumbersome and large packed size. Has a tendency of forming lumps which change the comfort experience. If you are trying to skimp on space and weight, the Aeros Pillow by Sea to Summit is your best bet. It's the best choice for backpacking because of it's packed size and weight. It's also fairly comfortable since the pillow is designed with synthetic fill between the cover and the TPU bladder. You can also adjust the level of firmness according to your liking. Also, the brushed polyester material is soft on the skin and wicks away moisture. This inflatable pillow has curves that cradle your head comfortable, whether you are back or side sleeper. It comes in 2 sizes: the regular inflates to 14x10x5 inches, and largely increases to 16.5x11.5x5.5 inches. The pack weight is also a winner for this pillow; the large weighs only about ounces and the regular even less than that. It’s very easy to inflate and deflate the pillow. The multifunction valve allows you to inflate it in just a few breaths. Deflating it is even easier, with a press of a button within the valve. To keep it clean, you can hand wash, and air dries it. It’s the best in pack size and weight. Moisture wicking material prevents odor from forming. The texture is also very gentle on the skin. A tad bit more expensive than the other camping pillows. Not quite as comfortable as the other options. Like most inflatable pillows, air tends to leak. At the beginning of the night, the pillow may be firm, but you will wake up with a softer pillow. The Onwego Inflatable Camping Pillow is another popular inflatable pillow popular. It offers a nice expanded size which is 20 inches by 12 inches, by 6 inches. When deflated and in the travel sack, it is a much smaller size which is 5.5 inches by 6 inches and weighs around 10.5 ounces. A unique feature of this pillow is that it self-inflates to up to 50 percent firmness. This reduces the number of breaths you have to blow in. Thus it's easier to inflate. Deflate the pillow is also very simple - simply open the valves and press or roll towards the valve. For additional comfort, the pillow top has plush foam interiors, while the bottom part has a slip resistant material. It also has a contoured design that cradles your head and supports your neck. The pillow is also constructed with special moisture resistant materials. It's easy to clean - just wipe with a damp cloth if needed. Self-inflates to 50 percent firmness. It’s also easy to inflate and deflate. Relatively comfortable for an inflatable pillow. You can choose from so many colors for personalization. Slip resistance doesn’t hold so well. Bulkier and heavier than the other inflatable option. The search for the best camping pillow is a longer process than you think. There are important factors to consider like the type of pillow, the size, weight, comfort level, etc. Like I mentioned earlier, there’s no single perfect pillow because we all have different preferences and it also depends on our use/purpose. Choosing a camping pillow is very personal, and the term “best” is very subjective. For me, the best camping pillow is the Nemo Fillo. It is very comfortable and ideal for my type of activities - hiking, backpacking, and camping. It may not be as light as the Aeros Pillow, but I’m willing to carry the extra weight in exchange for comfort. I hope this helped you on your search for the best camping pillow. If you have any questions, feel free to use the comment section to ask them.